Why I read this book: besides not being able to not finish a series when I start it? I enjoy Snyder's books! In this book we meet up with Opal Cowan again. After the epic battle at the end of Sea Glass, Opal has to deal with the consequences. Struggling with adjusting to her new abilities and lack thereof, she encounters a whole lot of trouble yet again. But Opal won't be stopped by this, she's on a quest to get her stolen blood back and put a stop to blood magic once and for all. 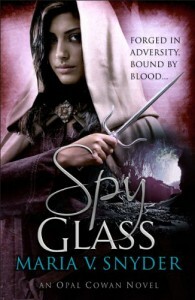 Of course, she's not alone in this and we meet Valek (from the Study series) again as he trains Opal in his area of expertise: spying (hence Spy Glass). Everything gets confusing for Opal when she starts to doubt her relationship with Kade, the Stormdancer and finds herself attracted to someone she never thought possible to feel anything other than fear and anger towards. I really liked seeing Valek again, he was one of my favourite characters from the Study series and after not being in the other two books, I was pleasantly surprised he had his part to play in this one. I appreciated how Snyder ended the series, but I was a bit disappointed at the development of the relationship between Opal and Kade. I understand her reasons and felt that in the end it was right, but I didn't like how Kade was treated as in that she showed him to be a different kind of person than I thought he was after reading the first two books. He didn't turn out to be a bad guy, and I still love him very much. I am however glad that Opal finds someone to love her just as she is, unconditionally. I had a hard time trusting this guy, but I grudgingly agree with her choice. I also liked that Opal finally realises who she is and that she doesn't need titles to define herself. Bonus points go to Opal's mother for being very funny in giving Opal the cold shoulder after she angers her. All in all, Snyder yet again delivered a very enjoyable book, though this one was a bit slower to me than the first two.